Should Halloween be Banned In Schools? Halloween is an exciting time for many children across the world. The excitement over planning costumes, getting together with friends and heading out for a night of trick or treating is one of the greatest thrills of childhood. Most years, Halloween falls on a school day, so children have to spend the day in the classroom before the fun begins. Many schools incorporate their excitement into a fun day of learning and activities. Some schools, however, have gone so far as to ban the holiday! Read on and tell us what you think! Early October my daughter starts planning for Halloween: what she wants to wear, the number of pumpkins she wants to carve and decorate, the decorations she wants to put in front of the house and most importantly the costume she will wear during Halloween day at school! It’s a whole month of planning, imagination and laughter for her and for all the family members! For safety reason, she is not allowed to wear masks at school nor so long a costume that kids stumble and fall! over it. I find those safety measures important and I make sure that her costume follows those guidelines! After all it is a fun day and I don’t want it to be missed because of a lack of planning! 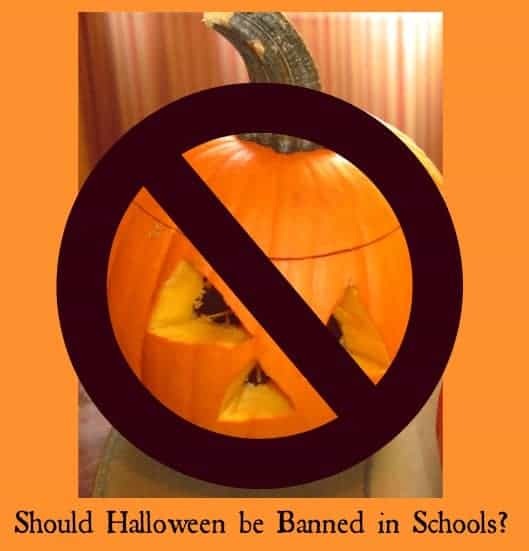 Banning Halloween in Schools: Yay or Nay? Since it is Halloween week, the TV, radio and online media are emphasizing the safety measures and requirements so kids can have a fabulous evening. One TV show showcased a school where Halloween was not celebrated! It was replaced by a spirit day: I think an orange day where kids are allowed to wear orange and black but no costume! The school was trying to accommodate people with low income budget and coming from different religious backgrounds. Some religions do not celebrate this holiday! I was a bit startled! I understand that some parents are on tight budget and some do not celebrate Halloween! But do you think that every child that celebrates Halloween cares about that? Do you think that every child who sees another friend wearing a costume understands that? Don’t you think it can create frustration among them! A Halloween costume does not have to be expensive! For my son I used to give him my husband’s shirt and jacket! I added a hat that I bought from Dollar store and you have a beautiful creative costume on a tight budget. Kids do not care about how expensive the costume is at this age, they want to have fun with their mates and be kids! Most kids also aren’t thinking of any religious aspect of the holiday. To them, it’s about dressing up and enjoying a day of creative play…and candy of course! Can we just let kids be kids and stop forcing adult thinking into their lives for just one day a year? What do you think? My mom use to make all our costumes when we were kids , and if other religions don’t like Halloween then they can keep their kids home. I always had Halloween in school, we even had a Halloween night, where the entire school was filled with games, cake walks, outdoor hayrides, and so on, and it was after hours once school was let out, but we did get to dress up during the day and wear are costumes if we wanted to. I say let the kids be kids have fun. Our school celebrates Halloween and it is something that the kids AND the teachers look forward to. And our Principal loves it to. It is a great break from all the hard work they have been doing for weeks and just after some pretty big state tests so it is a great chance to let loose and just have some fun. But not only that, I think schools that ban Halloween are going too far. It’s catering to the minority instead of the majority and that is where a lot of freedoms being trampled on is stemming from…being so concerned with being Politically correct and caring much more about the minority than the majority. I’m not saying the majority is more important, but that the minority shouldn’t be held in higher regard than the majority. I totally get your point of view! A ban is too much! Our school does a variety of other dress up days but doesn’t celebrate Halloween specifically – I am okay with that because it means that I don’t have to try and launder and repair costumes between school l and trick or treating… the school manages to incorporate learning into their ‘spirit’ days – the last one was dress as your favorite book character (and bring that book to share) – the dress up is there without the ‘Halloween’ connotation that some people prefer to avoid. I don’t really think it’s a big deal but it’s hard if some people are left out. Yes it is hard when other are left out! I don’t get this. Why wouldn’t kids celebrate Halloween? I think if the majority of classes are against the holiday, them majority should win. Yes! After all we are in democracy! We don’t celebrate Halloween as my religion doesn’t allow it. But I do remember in elementary school we’d have a celebration all day with educational activities, but students were allowed to dress up in costumes and some students, like me, couldn’t participate. Things haven’t changed so much as my niece will be having a Halloween celebration tomorrow, but since she won’t be in a costume, she is bringing halloween themed desserts. I think Halloween is becoming part of the American tradition so I like to have fun with my son and dress him up in whatever he wants to be and we celebrate at home with his cousins and have a little party, but we do not go trick-or-treating. I think the school traditions are fun, but like I said some students tend to be left out, so it’s a toss up. True! I think that Halloween is so fun for kids! One of my kids allows Halloween and is even having a school wide parade tomorrow! The other does not allow kids to come in costume nor do they celebrate Halloween at all. I agree: let the kids be kids! No political issues at school! As a former teacher, I can tell you this much – it’s not only for the reasons they’ve stated that they want just orange and black spirit days. Many teachers despise Halloween – kids are fussing with their costumes instead of paying attention, they lose pieces to their costumes and there’s tears, etc etc. Personally, I think a day to let kids be kids is worth any of the problems that may crop up in the classroom. In my classes, we usually started the day with Mass (I taught in a Catholic school and we wanted to be sure to focus on All Souls and All Saints as well) and then the kids would put on their costumes. We’d play games and have fun for the rest of the morning and then the afternoon would be a school dance (with movies being shown in another room for kids who didn’t want to go to the dance). It’s ONE day, it lets them see that their teachers care about them, and it provides a much needed break from the past two months of working hard! I completely agree with Cyn. I mean, I wasn’t a teacher, so I can’t really speak for the first part. But I think the frustrations would be worth it for the payout of fun! When I was a kid, we had these grand Halloween parades followed by a spooky movie in the auditorium. Not too spooky, of course! I fondly remember those days! My son’s school usually does some crafts and activities for Halloween, but they don’t actually say it’s about Halloween. I suppose I can live with that. What stinks, though, is when schools completely ignore the day. Yes, there are dozens of holidays out there, but Halloween has always kind of been a universal day of fun for kids. It’s not really about one religion or one culture. It’s about the fun! I must say, I completely agree. I feel like things are going WAY overboard now a days. We’re over thinking TOO much and we should really let kids be kids. Where is the FUN? Growing up, some of my best memories came from Christmas and Halloween fun…at school! I think things are being taken too seriously and it’s ruining it for the kids. They’re trying to make everything “politically” correct too much, and although that’s important to a degree, we also have to remember that many of the things are meant to be FUN and you can’t please everyone, either way. Too many traditions are being altered lately I think in schools. I agree with you! Although I respect that some people do not celebrate or cannot! There is no reason to ban it from school for the others! After all kids can choose to celebrate or not! I don’t see why schools need to place any importance on any holidays. There are simply too many and they create too many opportunities for conflict and inequality. They don’t serve any purpose in schools. There is plenty of time available outside of school for celebrating special days. I agree there are many holidays! It is just one day of fun and creativity for kids! It may not serve an educational purpose but it will make them happy and will help them with creativity! Does a Toddler Speech Delay Equal A Hearing Problem?